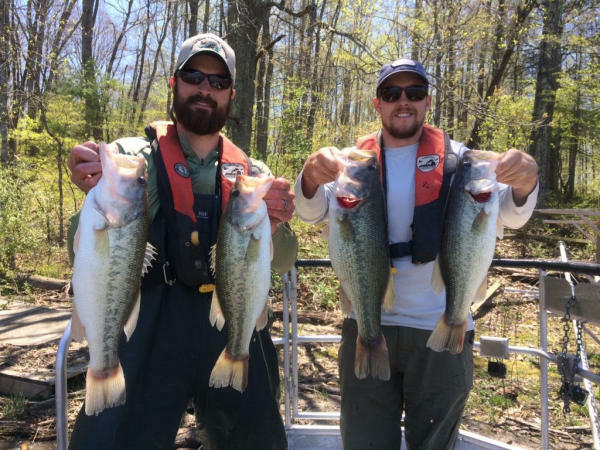 If you’re looking to catch a limit of sportfish this fall, Lake Merriweather in Rockbridge County is this year’s premier destination fishery for new and seasoned anglers. Lake Merriweather is owned by the Boy Scouts of America, but in 2018, DGIF established a partnership with the Goshen Scout Reservation and National Wild Turkey Federation to open the lake and surrounding land to the public. Lake Merriweather is 450 acres and is the second-largest lake in the district. Fishing at this lake is prime because the fish are not accustomed to heavy pressure from anglers. Largemouth bass and black crappies are the most common fish to catch here. 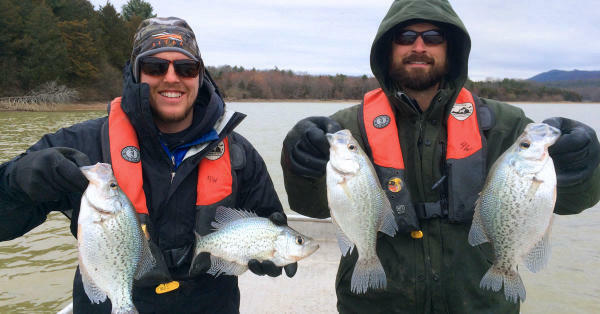 “It has a really good black crappie population that people are just in love with,” says, Jason Hallacher, Region 4 Assistant Fisheries Biologist. Crappie fishing is great for apprentice anglers because there is constant action of catching fish that can be a lot of fun for someone new to fishing. Lake Merriweather has been privatized for so long that it hasn’t seen many skilled anglers to cover the water. People that fish there are rewarded with great success. The lake also has sunfish, sucker fish, catfish and a lot of carp. DGIF just started sampling the fish populations, so the lake has not been stocked. Biologists conduct annual boat electrofishing and trap netting surveys in the spring targeting bass, sunfish, crappie, and catfish. DGIF is also conducting a Creel survey for anglers who fish the lake. Anglers are encouraged to report their catch after they are finished fishing for the day. Fishing survey cards are located at the boat launch and the shore fishing area. Accurately completing these surveys assist DGIF biologists with evaluating the fishery. In addition to fishing, Lake Merriweather has a lot of bald eagle nests on the eastern shore of the lake, and eagles are seen on a regular basis. This offers a great opportunity for bird watching from a boat or kayak. Other wildlife watching opportunities are present as deer, bear, turkey, and other birds are commonly seen, too. Fishing starts to heat up in the fall when the temperature of the water cools and fish are moving around the surface more. The lake is also less crowded during the fall because people are switching from fishing to hunting. If you want to try a new Virginia hot-spot this fall, don’t miss the chance to easily catch your limit here. Fishing from a boat or kayak is the best way to cover the water at Lake Merriweather. Bank fishing is available, but it is minimal. The bank fishing area is only about 200-yards long located in the lake’s emergency spillway. No gas motors are allowed on the lake, but battery-powered trolling motors are permitted. A PALS permit is required to hunt, fish, view wildlife or access the public portions of the property, in addition to all other applicable hunting or fishing licenses. Visit the Lake Merriweather page for maps, directions, and more details on lake regulations.